At least 2500 Dragon Stones. events mostly completed. story completed. Tons of Orbs. JAPAN VERSION OF DOKKAN. At least 2150 Dragon Stones. The transfer code is Android based and if it is transferred directly to iOS, all Dragon Stones will get lost, if you are a iOS user i can pull for you on the banner that you want! JAPAN VERSION OF DOKKAN. SSR form of the NEW Caulifla & Kale LR. At least 1000 Stones. Totally FRESH. story untouched. • GLOBAL VERSION OF DOKKAN. • SSR form of the NEW Gogeta AGL and Broly PHY. 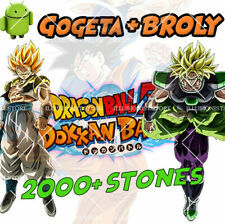 • 2000 DRAGON STONES. • boss rush completed. • events mostly completed. • story completed. GLOBAL VERSION OF DOKKAN. SSR form of the NEW Gogeta AGL and Broly PHY. 1000 Dragon Stones. TOTALLY FRESH. events UNTOUCHED. story UNTOUCHED. Gogeta LR. -Vegito Lr. -Goku ss4 LR. Everything is Legit no modding or duping. 1200 Dragon Stones. The transfer code is Android based and if it is transferred directly to iOS, all Dragon Stones will get lost, if you are a iOS user i can pull for you on the banner that you want! SSR form of Gogeta LR. Everything is Legit no modding or duping. a few Dragon Stones. Account dokkan battle Global; includes: - Level 370 . - 230 stones. If you play on IOS devices, all the stones will be lost during the transfer; to prevent this, downlad an Android emulator (e.g. : Bluestacks) and transfer the account there. SSR form of Goku&Frieza LR. 2000 Dragon Stones. The transfer code is Android based and if it is transferred directly to iOS, all Dragon Stones will get lost, if you are a iOS user i can pull for you on the banner that you want! SSR form of Vegito LR. Everything is Legit no modding or duping. a few Dragon Stones. If you transfer on iOS, all DragonStones are lost! All events untouched! GLOBAL VERSION OF DOKKAN. SSR form of the NEW Vegeta EVO PHY. 1000 DRAGON STONES. events UNTOUCHED. story UNTOUCHED. Tons of Orbs. 2800 Dragon Stones totally. 1300 Dragon Stones from daily logins. 1500 Dragon Stones from farming. a lot of Zeni. SSR form of the NEW Vegeta EVO PHY. 1200 Dragon Stones. missions UNTOUCHED. boss rush UNTOUCHED. events UNTOUCHED. story UNTOUCHED. Tons of Orbs. Gogeta blue bottom right unlocked. Current lvl 111-25 DS. One copy of AGL SSJ Gogeta, one copy of PHY SSJ Broly. SSR form of ONE random LR (Black, Boujack, Broly, Gohan, Goku, Mighty, Trunks, Vegeta). 1550 Dragon Stones totally. many Potential Orbs. a lot of Zeni. One copy of AGL SSJ Gogeta, one copy of PHY SSJ Broly. Compte Dokkan Battle pour Officiel Global. SSR form of a random LR. 1650 Dragon Stones totally. Q: Si j'achète un compte, est-ce que je garde les DS ?. Compte Dokkan Battle pour Officiel Global ￼. Random SSR form of a summonable LR (Black, Boujack, Broly, Gogeta, Gohan, Goku, Mighty, Trunks, Vegeta, Vegito). Before you transfer the account to your iOS device, you would have to install an Android emulator (NoxPlayer, Bluestacks, Droid4X) on a desktop-PC. JAPAN VERSION OF DOKKAN. SSR form of the NEW Goku SSj4 LR. At least 1000 Stones. Totally FRESH. story untouched. Account farmed quest Dokkan Battle LR 1400 DRAGON STONE . Also include: GOGETA BLUE AGL and GOGETA SSJ4 TEQ and many ELDER KAI. Random SSR form of a summonable LR (Black, Boujack, Broly, Gogeta, Gohan, Goku, Mighty, Trunks, Vegeta, Vegito). 1600 Dragon Stones from daily logins. many Potential Orbs. a lot of Zeni. GLOBAL VERSION OF DOKKAN. SSR form of the NEW Goku Black INT. 1000 Dragon Stones. TOTALLY FRESH. events UNTOUCHED. story UNTOUCHED. Account dokkan battle global Ios/Android Farmed....Cooler agl Ab2 e tanto altro. La condizione Nuovo. Dokkan Battle Jap with many Lr. La condizione Nuovo. Dokkan Battle GLOBAL RANK 301. Con mas 15 LR , muchos lideres de categorias, muchas dragon stone por farmear , muchos personajes con super ataques al 10 y 20.La vendo por falta de tiempo para jugar. Dokkan Battle for Android/IOS and Japan/Global. Global account (1100 Stones) Japan account (1200 Stones). Story completed. Accept all mission to get all dragon stones ( 1000). SSR form of a RANDOM LR, the NEW Goku & Frieza TEQ LR and Goku UI INT. 1000 Dragon Stones. SPECIAL PRICE ! events untouched. GLOBAL VERSION OF DOKKAN. SSR form of the NEW Gogeta AGL. 1000 Dragon Stones. TOTALLY FRESH. events UNTOUCHED. story UNTOUCHED. SSR form of Goku SSj3 LR. 1000 Dragon Stones. SPECIAL PRICE ! events untouched. SSR form of the NEW Goku & Frieza TEQ LR. 900 Dragon Stones. Everything is Legit no modding or duping. SPECIAL PRICE ! SSR form of Goku&Frieza LR, Gogeta LR and Vegito LR. 800 Dragon Stones. The transfer code is Android based and if it is transferred directly to iOS, all Dragon Stones will get lost, if you are a iOS user i can pull for you on the banner that you want! SSR form of the NEW Goku & Frieza TEQ LR. 800 Dragon Stones. SPECIAL PRICE ! events untouched. SSR form of the NEW Super Saiyan God SS Vegeta. 600 Dragon Stones. Everything is Legit no modding or duping. SPECIAL PRICE ! Compte Dokkan Battle pour Officiel Jap. 30 SBR (only events that were live during the farming). One copy of AGL Goku SSJ4 & STR Vegeta SSJ4 & Random SSR form of a LR (Black, Boujack, Broly, Gohan, Goku, Mighty Mask, PHY Trunks, Majin Vegeta, Cell, Bardock, Beerus, Goku&Frieza, STR Trunks). SSR form of the NEW Goku AGL and Frieza STR. 500 Dragon Stones. Everything is Legit no modding or duping. SPECIAL PRICE ! SSR form of Broly LR. 2500 Dragon Stones. The transfer code is Android based and if it is transferred directly to iOS, all Dragon Stones will get lost, if you are a iOS user i can pull for you on the banner that you want! JAPAN VERSION OF DOKKAN. At least 2100 Dragon Stones. The transfer code is Android based and if it is transferred directly to iOS, all Dragon Stones will get lost, if you are a iOS user i can pull for you on the banner that you want! SSR form of the NEW Goku & Frieza TEQ LR Goku UI INT. Around 500 stones Dragon Stones, you can have a few less or a few more. Everything is Legit no modding or duping. SPECIAL PRICE ! JAPAN VERSION OF DOKKAN. SSR form of the NEW Gogeta AGL. At least 1000 Dragon Stones , but it can have 1100-1200 too. events untouched. story untouched. Tons of Orbs. GLOBAL VERSION OF DOKKAN. SSR form of the NEW Broly PHY and Broly LR. 1000 DRAGON STONES. events UNTOUCHED. story UNTOUCHED. Tons of Orbs. SSR form of Goten&Trunks LR & Gohan LR. The transfer code is Android based and if it is transferred directly to iOS, all Dragon Stones will get lost, if you are a iOS user i can pull for you on the banner that you want! JAPAN VERSION OF DOKKAN. SSR form of the NEW Goku Pan Trunks LR. At least 1000 Stones. Totally FRESH. story untouched. DragonBallZ Dokkan Battle Global, Lvl 150, 5LR etc.